Moleskine notebooks have become one of the go-to drawing tools over the last two decades for anyone looking to record their ideas. Famed for quality as well as style, the Italian company has also made a name for itself with its creative collaborations, including this new range of journals inspired by Disney Pixar’s Toy Story. Made up of four different hard cover notebooks, the Toy Story journals are a sweet addition to Moleskine’s extensive selection. Each comes with a charming illustration on the cover, including images of everyone’s favourite cowboy and space ranger. 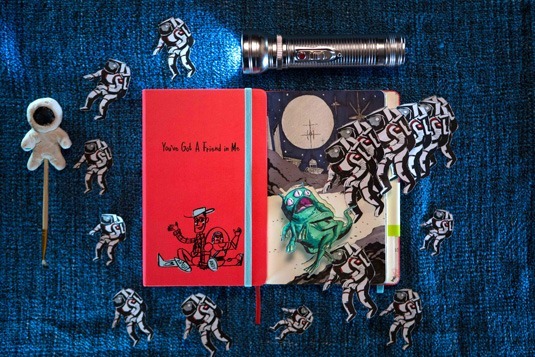 A digital film like Toy Story and Moleskine’s analog notebooks make a surprisingly good match. Pixar’s Designer and Director Ralph Eggleston explains how the two go hand in hand. “To find the design of characters like Buzz and Woody we must have sketched thousands of pages of different approaches,” he reveals. “Though the film was a landmark in computer-generated animation, we still used pen and paper to help conceptualize the world. In fact, that’s how we still work at Pixar. Everything starts with a notebook and a pencil. From there, our movies begin,” Ralph adds. Complete with a specially shot video by Edson Oda and Ivan Bordas, these notebooks will keep your inner child alive and help you live out your fantasies on paper.